Dark tea is a Chinese tea similar to pu’erh. 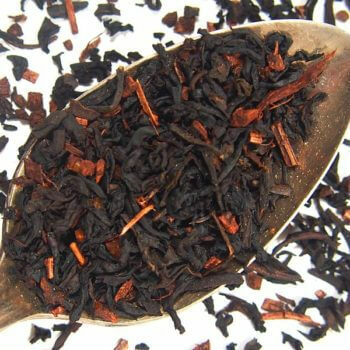 Aged and fermented, dark tea has a wonderfully rich and complex flavor (and steeps multiple times, with varying layers of flavor appearing from each level). 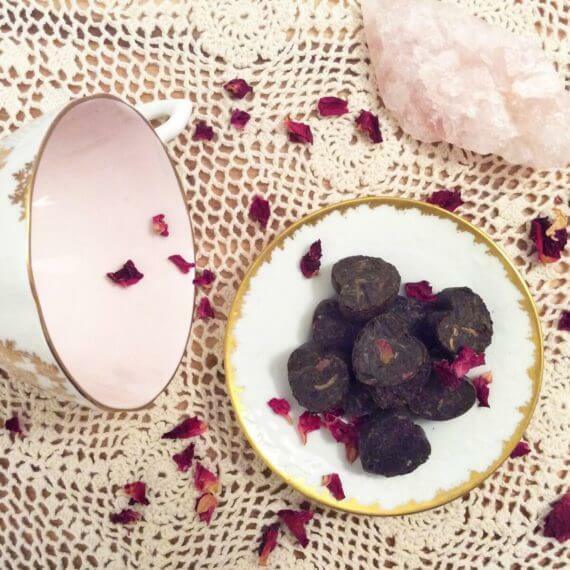 We combine the dark tea with rose petals and vanilla for an inviting, aromatic brew. 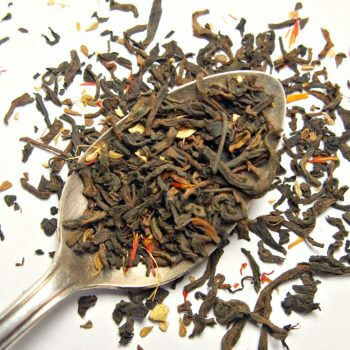 If you haven’t had much experience with pu’erh before, we believe dark tea is an excellent introduction. This particular blend we feel is also excellent to share with friends plus good foods and good conversation. Our dark tea is pressed into heart shapes before aging – the tea was originally pressed into cakes by tea merchants to help the tea survive long journeys. These heart shapes are just the right size for a cup – just pop one into your infuser and brew as normal. Each pouch contains approximately 10 hearts (1.5 oz). Each heart is approximately 5 grams of tea. I loved this tea. It was everything I’d hoped it would be and more after reading the description online. A light and earthy tea. The heart shape is perfect to plop in my water and watch it open to become a beautiful mix of flavors. Honey and a dash of cream makes this tea a delightful afternoon drink with a hot cinnamon roll. Tasty tea! Cute shape and easy to use, just throw one heart in a strainer and use for multiple steeps. Very rose forward flavor in the initial couple of cups. I've had pu'erh before from another company, and didn't really love the flavor that much (too earthy). This tea is delicious and nothing like that other stuff. I tried in on the recommendation of other members in the tea club, and I'm so glad I did! Absolutely love the ease and conveniently measured portion, and the heart shape is just adorable for Valentines or any day you want to express your appreciation for someone. And of course, the flavoring is superb. Highly recommended. The hearts are adorable! I just put the heart in a loose leaf teabag and put in my pot of tea, it was so easy! It is definitely a delicious dark tea, it reminds me of a nice black tea. It goes nicely with chocolates or a rich dessert. 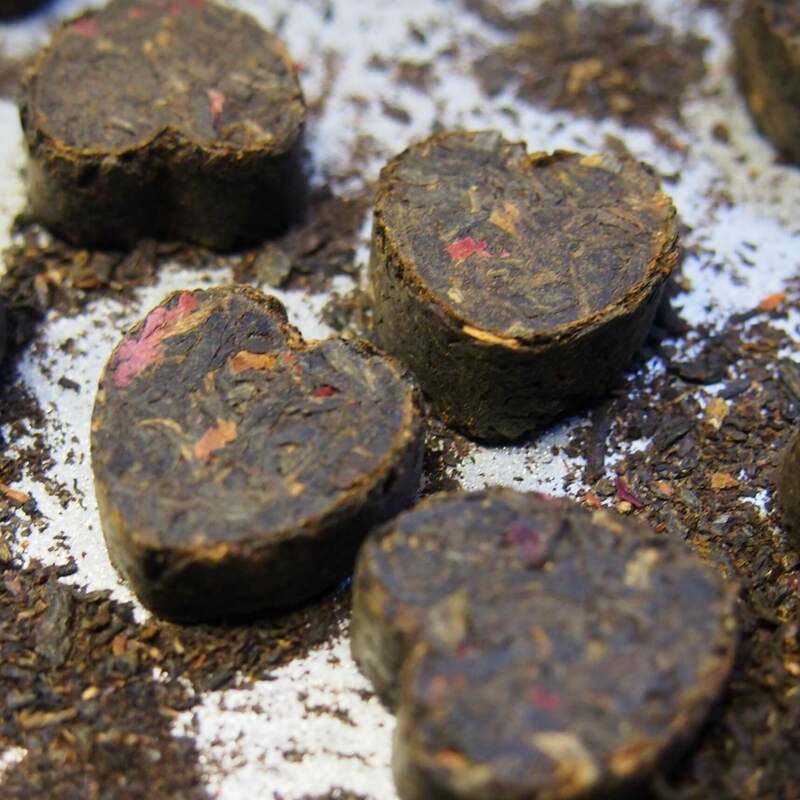 Ingredients: Dark Tea (Pu’erh), Rose Petals, Vanilla Essence. Has Caffeine. Preparation Instructions: Use 1 heart per 8oz water. Steep with boiling water for 3-6 minutes. A longer brew will result in a stronger flavor profile. 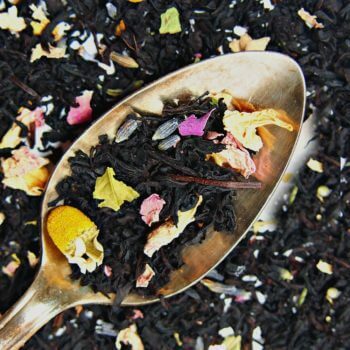 Dark tea can produce multiple steeps - you'll find less vanilla/rose with multiple steepings but also other interesting notes - we strongly consider it! Suggested Uses: Great by itself, though you may consider a dash of honey to highlight the various flavor nuances.